Downtown Bay City was filled with the sights and sounds of the IRISH on Saturday night. The White Pine Pipe and Drum Corp, from Midland, toured the Center Avenue area of of Downtown Bay City on Saturday Night - St. Patrick's Day. 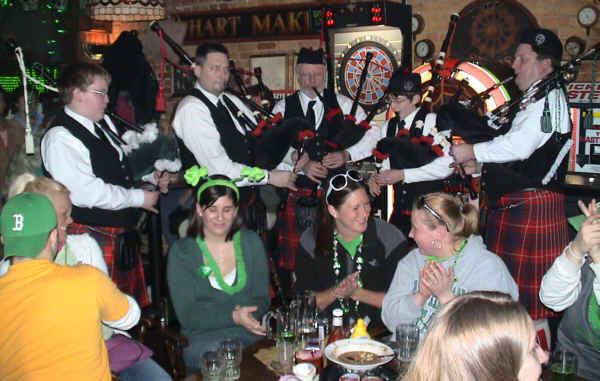 The Pipe and Drum Corp visited Old City Hall on Saginaw and Mulligan's on Center Ave, providing a splash of Irish music. The musicians were accompanied by the White Pine Highland Dancers, who performed to the warm and generous applause at each stop along the way. Dancers were: Megan Durisin. Emily Durisin, Hannah Dewald and Kat Siegel. The musicians and dancers will also be appearing at the Midland Highland Festival on June 16, 2007. White Pine Highland Dancers danced and entertained at Old City Hall on Saturday night. Dancers were: Megan Durisin. Emily Durisin, Hannah Dewald and Kat Siegel.